www.79-85gm-ebodies.org: The History of the Cadillac Eldorado. Rocket fins, rocket exhaust flame-shaped tail lights, and lot's of chrome dominated the Fifty's Era Cadillacs and with the introduction of the brand new Eldorado it was just beginning. In the middle of the 1953 model year Cadillac introduced its new El Dorado (two separate words) as a limited production (532 built and 532 sold) convertible, the Special Sport Series 62, style 6267SX. It came with everything available at that time as standard equipment. It sold at a base price of $7750 while a Coupe de Ville 2dr. Riviera style 6237X cost $3995 and a regular convertible style 6267X at $4144, It was the most expensive of any Cadillacs produced then. The 1956 El Dorados stood out from the standard Cadillacs with an even higher performance engine. The El Dorados were equipped with two four-barrel carburaters and the engine was rated at 305 HP @ 4700 rpm. The other models received a 285 HP engine. For the first time, an El Dorado hardtop was also offered at the same price as the convertible. the 1956 convertible was called the El Dorado Biarritz and the hardtop the El Dorado Seville. Both names would be used in the future and the Seville would become a distinct car of it's own. See the Sevile History. 1957 - For the first time G.M. designed their cars with hoods that were at the same level as the front fenders. It was so much sleeker and just looked so much nicer than the years before that it's worth noting. This major design change would be the beginning of even better looks for all of G.M. 's cars. I have to point out though that Ford and Chrysler also did this for their respective 1957 models. There must have been some serious industrial espionage going on back then !! This year was also important because of the introduction of one of the Eldorado's most remembered models, the Eldorado Brougham. The new 4-Dr hardtop (Riviera styled, though not called that) with rear-hinged ("suicide") rear doors was a luxury car that cost $13,074, twice the price of any other 1957 Eldorado and more than the 1957 Rolls-Royce Silver Cloud. It featured quad headlights (not legal in some states yet), a stainless steel cover on the roof, air suspension, memory power seats, and every other available comfort and convenience feature that GM offered, including miniature bottles of perfume. 1960 was the last year offering the Biarritz and Seville names for the Eldorado. For the Seville, it disappeared and wouldn't be seen again for another 15 years. In 1965, the Eldorado lost it's status as the number one Cadillac and became a model of the Fleetwood, the Fleetwood Eldorado. Cadillac changed it all back in 1967 with the introduction of the new front wheel drive "personal luxury" Eldorado as a coupe model only. According with tradition, as a coupe, it should have properly been called a Seville. The Eldorado, was re-designed and was Cadillac's version of the "Personal Luxury" car in competition with the Thunderbird. As a 2 door Coupe, the car shared the E-Body with the Riviera and Toronado and the long hood, short rear deck of the Toronado which was introduced the year before. For the first time it became a FWD car sharing the Toronado's Unified Powerplant Package with front-wheel drive. In 1968 front disc brakes were made standard. On a 120 inch wheelbase it was just at the upper limit for a Standard size car. In my opinion this is the Eldorado's best styling incarnation. Of special interest is Mark Bristol's 1967 Eldorado named "Elle" pictured on the left. It is so special that I've given it the distinction of being the first non 79 to 85 car to have it's own page. You can see more of "Elle" and read about her heritage in Mark Bristol's own words on "My Special E-Body" page. Once again, the Eldorado grew in size for 1971. 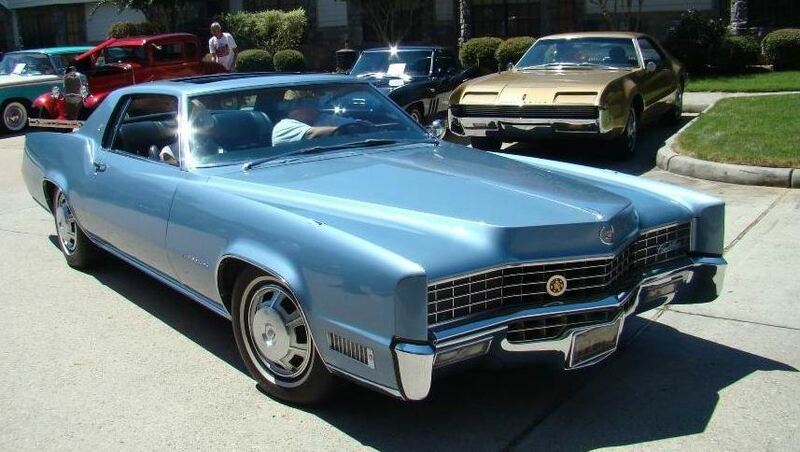 The 126.3 inch wheelbase Eldorado would run through 1978, receiving facelifts in 1973 and 1975. As before, the Eldorado and Toronado shared the Unified Powerplant Package with FWD. All 1970's cars including Cadillacs suffered due to the OPEC (Oil Producing and Exporting Countries) induced oil embargo. The Eldorado was fitted with an 8.2L engine in 1970 which had an MPG rating of around 10 to 12. That wasn't going to go well with the price of gas going up and the availability of it going down. GM's slow development times and Cadillac's decision to make all of it's cars bigger would haunt them through out the 1970's. A convertible was offered again for the first time since Eldorado went FWD in 1967. Convertibles from any manufacturers are inherently heavier and more costly because of the extra structural components needed to strengthen the body. Motors and steel actuating mechanisms for the canvas top all contributed weight. That meant even less MPG for them. In 1976, when all other domestic convertibles were discontinued, GM heavily promoted the American industry's only remaining convertible as "the last American convertible". 14,000 would be sold, many purchased as investments. The final 200 convertibles produced were designated as "Bicentennial Edition" commemorating America's 200th birthday. These cars were white with a dual-color red/blue pinstripe along the upper bodyside. In 1976 however, all of the design teams worked together and incorporated ideas from all divisions to come up with smaller, more fuel efficient (by their standards) vehicles. The last year of this decade would be the beginning of a wonderful time. It brought our cars into being.